Increased use of air conditioning and refrigerators in the heatwave is causing a surge in power demand. Latest figures show the lunchtime peak for electricity last Tuesday was 1,000 megawatts (MW) above normal in temperatures of up to 25C (77F). National Grid said air conditioning, refrigeration and other cooling machinery accounted for much of the increase in demand. Peak demand is normally about 44,000MW at this time of year. A National Grid spokeswoman said: "Demand is up at the moment and that is partly due to the increased use of air conditioners and refrigeration. "At the moment there is no alert - we are continuing to maintain the system as normal." At the same time last year the peak was 2,000MW below normal when the temperature was just 18C (64F). Power surges of about 2,000MW were experienced during England's World Cup matches this year as TV viewers made half-time cups of tea. Meanwhile, gardeners are also feeling the effects of the scorching conditions. Kevin Smith, commissioning editor of BBC Gardeners' World magazine, said: "It has been a struggle for gardeners this summer and the hot conditions haven't helped at all. Gardeners are adapting and just looking to plant different plants. "Trees and shrubs are dropping their leaves earlier than normal, the soil is becoming very cracked and hard making it impossible to plant it, and containers are impossible to look after because they're drying out. "Lawns are looking terrible, but you don't have to do anything because they will recover. "If we get a wet winter I'm sure gardens will be fine next year." Guy Barter, head of advisory services for the Royal Horticultural Society, the situation was "reasonably serious". "It's the hot end of the spectrum that plants have to put up with. The amount of heat they're getting means they stop growing." However, there were some benefits for plants. It could make plants stronger, resulting in more impressive blooms the following year. "On balance we know that a hot, dry summer produces better flowers than a wet summer. It's not necessarily a bad thing," he said. The hot weather is boosting consumption of water, both from bottles bought in shops and coolers in the workplace. British Water Cooler Association chairman Michael Barnett said: "Consumption of bottled water through water coolers was some 435 million litres in 2005. "However, we estimate that demand in 2006 will be in excess of 550 million litres based on the experience of recent months." British Soft Drinks Association spokesman Richard Laming said: "Past experience shows that for every degree the temperature rises above 14C, sales of water increase by about 5%. "This means that at 28C, sales of water double." 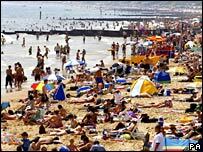 Forecasters predict the heatwave will continue with highs of 33C (91F) in the North West on Tuesday, similar temperatures in the South and East on Wednesday, and reaching 32C (90F) in London on Thursday.